George Walters-Marrah was one of only 211 students in the nation to receive a 2018 Goldwater Scholarship. Two UCF students recently were honored by the Barry Goldwater Scholarship Program and Excellence in Education Foundation for their outstanding undergraduate research. Goldwater Scholarships are a prestigious honor that recognizes exceptional research work by undergraduate sophomores and juniors in the natural sciences, engineering and mathematics. Junior George Walters-Marrah was awarded a 2018 Goldwater Scholarship, a prestigious honor that recognizes exceptional research work by undergraduate sophomores and juniors in the natural sciences, engineering and mathematics. This year’s pool was narrowed down from a field of 1,280 students nominated from more than 2,000 colleges and universities nationwide. 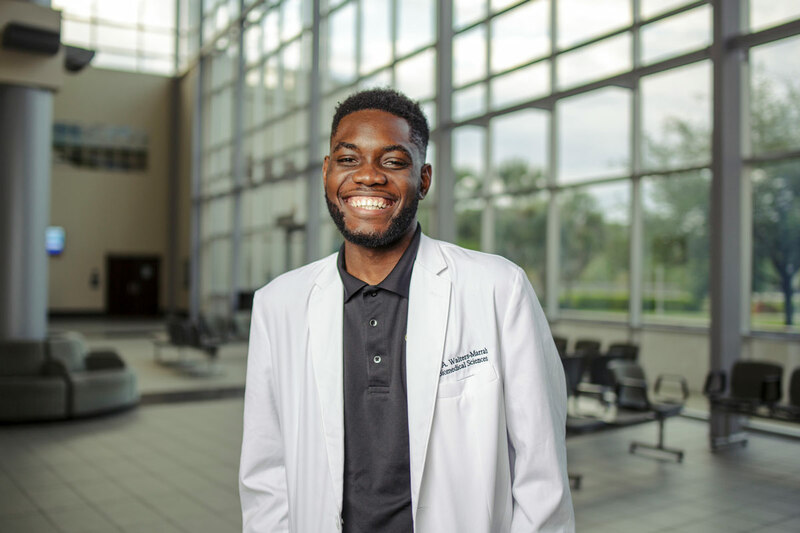 Walters-Marrah, a biotechnology and molecular microbiology major, was named as a scholar as a result of his research on Mycobacterium abscessus (Mab), an environmental mycobacteria often found in bodies of water and decomposing vegetation. Mechanical engineering major and honors student Minh-Chau Le was also recognized by the Goldwater Foundation, receiving an honorable mention for her research in the development of bioengineered materials and devices for cancer research. She was one of only 281 nominees to receive this recognition. Le is a Provost Scholar and 2018 Order of Pegasus recipient. In the past two years, UCF has produced two Goldwater Scholars and one honorable mention. If you are a student interested in applying for a Goldwater Scholarship, please contact Morgan Bauer, director of prestigious awards, at Morgan.Bauer@ucf.edu.